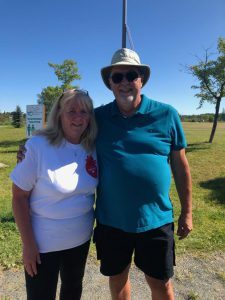 This year’s organ donation walk grew more than expected. Timmins resident Leslie Tinney is trying to rally the community together and spread awareness on the province’s organ donation program. Tinney lost her 23-year-old son to an asthma attack is 2016. She says he had signed an organ donation card, and she didn’t know about it. Tinney says at first she didn’t agree with the decision, but eventually granted her sons wishes. His organs ended up saving four people’s lives. Tinney says this Saturday’s walk at Gillies Lake focused and that information and she triple the support from last year. She says this year, five people who are organ recipients participate din the walk, including the man that received her sons heart. Tinney says it felt great to have a little piece of her son there to support the cause. Leslie Tinney with the man who recieved her son’s heart. Photo supplied. She says it was also amazing to see the number of people in Timmins who have been helped by this program. Tinney says Timmins has a 51 per cent donor rate, but she would like to see it hit 100 per cent. She says she will continue spreading information about the program.